ALL THE LITTLE ONES AND A HALF! All the little Ones - and a Half - (the little Ones often forget Half because she is so small) live a peaceful life. They have never seen a big number - big numbers are scary. One day a big bad Hundred comes along and threatens to take over the little Ones' house. Half has a plan - all the numbers must stand together and be counted. If they add up to a hundred, they will be as big as the Hundred and they can stand up to him. Five counts up all the numbers by filling in the correct number of squares for each number on a chart with a hundred squares. He nearly forgets to count Half. But Half makes all the difference; with her, the numbers add up to a hundred and a half - too big for Hundred to fight. 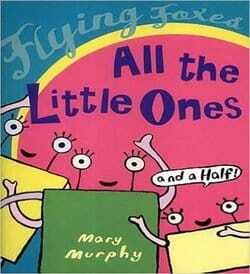 Mary Murphy’s (2001) ‘All The Little Ones and a Half’ is a story about all the Little Ones and a Half who have lived happily, alongside the Little Twos, Threes, Fours and Fives, until they are chased away from their homes by a big bad Hundred. Half (who is often forgotten by her peers because of her small size) comes up with an ingenious idea to stand up to Hundred, that is for everyone to join together and be counted. To their despair, it soon becomes apparent that they are not bigger and stronger than Hundred – they are just the same size as the bullying Hundred. It is only when Half reminds everyone that she should be counted too that they realize that they are now bigger and stronger than Hundred … by a half! Together, they are able to successfully stand up to and chase away the big bad Hundred. This story is perfect for introducing the concepts of place value, number comparison and fractions. Page illustrations are very visually pleasing, and the ones showing a Half in relation to her peers (Ones, Twos, Threes, etc.) are also incredibly useful to help young readers visually see what a half is like compared to the other numbers. Mathematics asides, the story also has a great message about inclusion and team work, not to mention a great female protagonist! 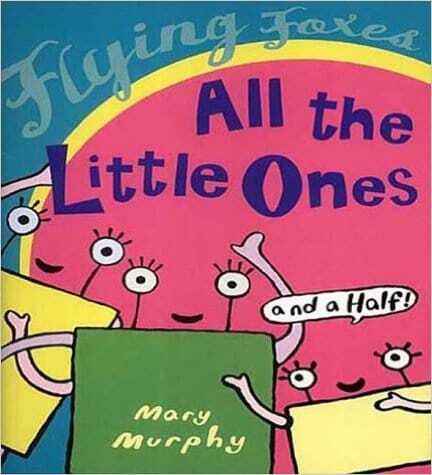 All in all, ‘All The Little Ones and a Half’ is a perfect story for children aged 6+ years old to learn about place value, number comparison and fractions in a really fun and engaging way! Highly recommended!